By now most of us have seen ‘Get Out‘, arguably one of the best films of the year thus far. 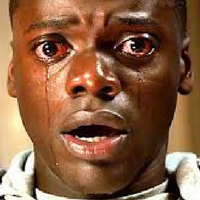 While most people left the theatre disturbed yet pleased with the ending, Director Jordan Peele has released an alternate ending to the film which ended up getting canned due to its horrifying (but possibly more realistic) ending– and we’re happy it was. In the original ending, after killing off his psychotic girlfriend and her family, Chris (Daniel Kaluuya) is rescued by his best friend Rod (Lil Rel Howery) and everything is all fine and dandy (we assume). The canned version, however, is a horse of another color, and a morbid reminder that in real life, that sigh of relief doesn’t always come. Check out the clip below and prepare to be depressed…possibly for the rest of the week. ‘Get Out’ is currently available on Digital HD and will be arriving on Blu-ray, DVD and On Demand Tuesday, May 23.